« Do you trust Facebook? Control Your Social Activity For Free! ThinkUp is for organizations and personalities who are active on social media networks, have more than 1,000 friends or followers, and need deeper analysis tools to derive meaning from those interactions. Government agencies who want easy ways to survey constituents, analyze and share response sets as well as track and archive conversations. Personalities like journalists, bloggers, and celebrities who want easier ways to manage interactions and compile feedback from fans and followers. Publishers like bloggers or broadcasters who want easy ways to measure reach and analyze content performance on social networks with readers, subscribers, and followers. At its heart, ThinkUp is a conversation analysis tool. ThinkUp helps you pose questions to your followers on social networks, and compile and share the responses, whether you’re The White House asking U.S. citizens what our country’s next Grand Challenge should be, or a writer asking what the best brand of ballpoint pen is. Analyze: Get insightful graphs and charts in a single simple dashboard which helps you make sense of your social network activity. Search: Ever get frustrated that Twitter doesn’t let you find a tweet you posted a year ago? ThinkUp archives all your tweets from the time you start running it, plusall its replies and retweets, and makes them available to search and export. Visualize: ThinkUp’s rich visualizations let you see your conversations mapped across the globe, or as a collection of most-frequently mentioned keywords. 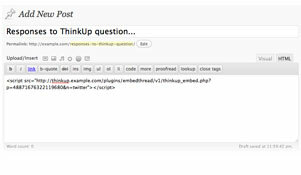 Publish: ThinkUp lets you publish and embed conversations on a blog or website. Everyone can benefit from the wisdom of your social network. Export: Export your tweets at any time and open them as a spreadsheet in Excel for further analysis. Or just save them for recordkeeping. So hurry on over to ThinkUp and check out it’s free, open source web application and begin capturing your posts, tweets, replies, retweets, friends, followers and links on social networks like Twitter and Facebook. This entry was posted on June 4, 2011 at 7:24 pm and is filed under Uncategorized. You can follow any responses to this entry through the RSS 2.0 feed. You can leave a response, or trackback from your own site.